For more information on Ms. Oregon, contact us today! 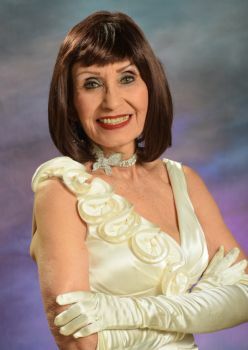 CONGRATULATIONS TO MARCIA ZADIAN, Ms. Oregon Senior America 2019! Marcia has 3 children, 3 grandchildren and 7 great grandchildren. Her 3 children are all critical care Register nurses in Orange County and Central California. Her greatest joy is going to visit her family in central California where all her great grandchildren are keeping her young. She works as a Security guard for the Anaheim Ducks Hockey team part time and loves every moment of it. She retired in the work field in 2010 as a bookkeeper and as a Dental Hygienist in earlier years. She is a strong advocate for senior health and steering people from debilitating diseases, working as a Weight Watchers spokeswomen for 18 years, she claims there is nothing better than to see someone get their self esteem back after lose weight. She has a book of success stories, people she has helped lose weight and improve the quality of their lives. She graduated from UCLA extension school in Dental Hygiene in the early 60's and was trained by Weight Watchers in weight loss and nutrition. She attendant Cerritos College for extensive computer classes. She has won several first prize awards for her crochet work from the OC fairs in the doll division. She taught oil painting for 17 years and has currently gone back to it, winning honorable mention for several of her oil paintings. She has entered pageants for 10 years where she has "come alive". She is in a performing group called the Sensational Ladies. She loves seeing the happy faces when the group goes to perform at nursing homes and seniors centers and calls it her Life Mission Work! She loves pageantry because it showcases active senior women and their journey who can step into the lime light and feel self worth plus being a role model for other seniors and even young adults.